So you just launched a new website! Congrats, but now what? What are you going to do with it? You’ve invested time and money to have a custom website built to represent your brand, and now it’s time to see some return on that investment. Oftentimes, people think that once the site’s pages are live and launched, the Googles and Bings of the world will automatically start having your business show up in the search results. Unfortunately, this is not the reality, and the real work is only beginning once your site goes online. Contrary to popular belief, a professional website is not a “set it and forget it” marketing strategy. A well-designed website is the modern day equivalent of a brick-and-mortar storefront or office. It provides a first impression of your brand and serves as a 24/7/365 creative space to showcase your products or services. If you want your customers or audience to stick around, you’ve got to give them a good reason to do so; you have to provide some sort of value. Just think about the value you receive from the websites you frequent, and the many forms that value can take. You receive new and interesting content, such as advice, op-eds, articles about new ideas and innovations. You interact with people and brands to build relationships, shop and explore. You interact with these brands on social media, right alongside your best friends and family, and these brands are always competing for your attention with new and innovative ways for you to view and interact with their content. In order to attract people to your website, you’ll want to incorporate as many of these benefits as you reasonably can into your overall marketing strategy. And there’s no need to reinvent the wheel, just look at what other successful brands are doing. While surfing the web, you are constantly fed new and interesting content. Everything from your daily news and shopping ads to DIYs and cat videos. This content makes up the essence of the internet; it’s why we’re all here in the first place. One of the best ways to consistently lure the crowds to your website is to create some content of your own. The key to this is to first define your audience. Who are you going after? Small or medium sized businesses? Professionals? Students? Entrepreneurs? Just think about who your ideal client or customer is. Think about the questions they have about your industry or offerings. Writing a blog can also function as a way of educating your audience, and in the process you become known as an “authority figure” to your visitors. First, make a list of general topic areas you’d like to cover, and then select specific topics within each realm that you can talk about. Educate your audience and explain to them the intricacies (and value) of what you do, or how they can better their own experience with your product or service. If you want to figure out what might interest your audience, think about what interests you. Think about the more complex and technical parts of your profession and how that relates to the everyday customer. Take a look at what people are talking about online to get an idea of the hot topics of the day. Each piece of content you write should be able to be directly tied to your marketing efforts. Stated differently, you should be able to end each piece with some sort of soft “call-to-action” that draws people to the money-making side of your business. That’s what all marketing efforts are for after all. Once you have your list of source material, you’ll need to make a blogging calendar and stick with it. One or two articles per month (~1000 words each) is respectable for a new startup, larger and more established firms should aim for 3 to 6 original articles per month. When publishing, it is also critically important to tag and format your post appropriately so that it has a decent chance of showing up in a Google search results page, but we’ll cover that a little further down. Through genuine interaction with brands in the virtual world, real relationships are built and maintained. Relationships allow us to build trust and gain a more devoted following. Listen when people inquire about your products or services, and always try to help and give sound advice when given the opportunity. Always remember that the people you serve are the foundation of any venture, and they should be your first thought when considering any strategic decision. Build great relationships and great success will follow. Remaining authentic when you represent your brand online starts with the content you put on your website and your social media accounts and continues with your engagement with people. A great strategy to start with is to give a shout out to your favorite or new clients on social media. They will appreciate the boost you give them and they may return the favor on their own accounts, resulting in greater organic reach for both of you. Also, take the time to respond to any comments or messages you receive on social, as those leads can be just as valuable as any other more traditionally obtained leads. Always offer to get on a quick call with people if the situation warrants it. Better trust and relationships are built when people can hear each other’s voices. The key takeaway here is just to remember that much of corporate success depends on people. When you exceed expectations, people tend to remember. And if you aren’t aware of the customer service revolution happening out there, just google around and see what companies like Amazon and Zappos have been up to. Respect and authenticity in customer service is the single best way to maximize ROI, as it will build your following and help ensure long-term success. In today’s techie world, a plethora of 100% free marketing channels serve as top resources for building your business. To spread the word about your new site and overall brand, you need to tell people. Social media is only the beginning and if you dive in without a clear and concise strategy, you’ll quickly become overwhelmed. I may sound like a broken record, but any great online marketing strategy has to start with the content. Once you have your content in place, you can figure out the most efficient strategy to distribute and promote it. Know your target demographic and their top social platforms, and take a look at what others in your industry are doing. Where do you find the best content and community around your industry? Where do you go when you need questions answered? Websites like Quora and Reddit allow people to discuss specific topics in great detail with large communities of experts. Consider searching Quora for unanswered questions and take some time to write out a thoughtful answer for any good ones you see. Other people will see your answers to questions and if they like them, you’ll be up-voted and seen by even more people. This strategy is becoming more and more popular with start-ups, and still yields great long-term results if you can dedicate the time. As a technical matter, the general rule of thumb is that your promotional posts should be limited to 20% of everything you publish. Remember to be a real person, reciprocate the favor and give others your thoughtful advice and critique when asked. Whatever you decide, remember to follow through with your social strategy. Social and online marketing is not something that pays off overnight, it takes strategy, dedication and creativity. It is far better to be a rock-star on 2 or 3 social platforms than merely present on 10. Change is, and has always been, the only constant. What this means for your new website is that at some point, it will inevitably need to be updated. Your website was built using several different technologies, using different coding languages, different frameworks, different software programs, being viewed on many different devices and screen sizes — lots of moving pieces that are constantly interacting with each other. Each of these pieces are essentially an independent entity or product, maintained by an organization or in some cases, an individual. Just with any technology (think smartphones, computers, your OS, or anything tech), the tech that makes up your website is constantly being updated. In order to keep your website secure and running smoothly, it is imperative to stay on top of updates. Another common issue for business owners is known as Search Engine Optimization, or SEO. SEO is simply the practice doing things to optimize your web presence in the results pages of Google and the other search engines. There are literally millions of things you can do to help optimize your website, and there is no proven “rule-book” for success. Identifying the critical components of SEO will take a separate blog post (stay tuned! ), but for now, check out the basics here. What works today is never guaranteed to work tomorrow. As web designers, we have to constantly be thinking about and assessing the future and where it is going. The best recent example of this was last year’s Google update, dubbed “Mobilegeddon” by the media. Google recognizes that more and more people access the internet on mobile devices, and as such, if your website is not specifically equipped to optimize viewing on a mobile device, Google doesn’t think it should show up well in the search rankings. Google would rather show people websites that will look good on their phones and tablets, giving the googler a more satisfying experience. Any business owner who did not ensure their website was mobile-ready was penalized after this update. This is just one example of how being unaware of web technology is simply not an option for business owners today. All in all, it’s a pretty simple concept. 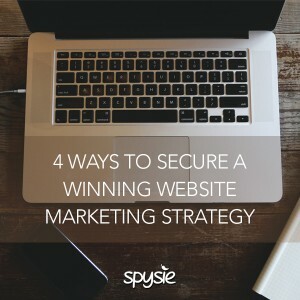 If you’re having trouble getting started with your marketing strategy, just take a look at what successful brands are doing on their websites and social media accounts. Sure, they have multi-million dollar support behind their efforts, but with a little perseverance and elbow grease you are sure to grow a decent following for yourself. Just remember to stick with your efforts, don’t abandon your brand or your audience. Continue to deliver great, compelling content, and don’t be afraid to inject your personality into your content. Figure out the best platforms to promote your content, where your ideal customers might be hanging out, and make sure you’ve got a fantastic looking website and social pages to impress them with. As with most things in life, the hardest part is getting started. This is where the rubber hits the road, where the nose hits the grindstone. Find what inspires you. There are billions of people in this world, if you share your honest voice, you are bound to find a devoted following of like-minded people out there who will support you. For further reading, check out our posts on how to build a competitive website and current SEO trends. If you want to chat, you can always get in touch with us here.